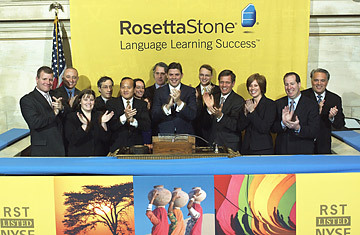 Rosetta Stone celebrates its IPO at the opening of trading at the NYSE on April 16, 2009. Épicé. Caliente. Hot. In any tongue, stock in Rosetta Stone, the popular language-learning software company that just went public  yes, IPOs still exist  is blazing. On the evening of April 15, the company was able to price its IPO at $18 per share, above the estimated range of $15-17. It was the first IPO to price above its range in nearly a year. The next day, shares shot up 40%, the best one-day IPO rise in the last year (on April 23, the stock closed at $25.60 per share, 42% above the IPO price). Why are investors rushing to Rosetta? First off, the company's growth has exploded over the past four years. Rosetta Stone generated $209 million in revenue in 2008, compared to $25.4 million in 2004  that's a 723% increase. Net income grew 632%, to $13.9 million, over the same period. Some 95% of Rosetta Stone's revenues come from the U.S. market, so there's a huge growth opportunity overseas. Plus, institutional customers like schools, corporations and government agencies account for some 20% of the company's sales. Rosetta Stone recently created a customized Arabic program for the U.S. Army, which includes military-specific vocabulary, and the Defense Intelligence Agency is a client. "These institutional revenue streams tend to be pretty steady," says Brady Lemos, equity research analyst at Morningstar. "The terms are often locked in over a period of time, which protects the company a bit from consumer spending swings." Thanks to relentless marketing  Rosetta Stone commercials, some of which featured Michael Phelps after the Olympics, are ubiquitous  and a strong retail distribution network that includes Amazon, Apple, Barnes & Noble and mall kiosks throughout the country, Rosetta Stone is the most recognized brand in the $5 billion U.S. language learning market (worldwide, the Nielsen Company estimates that language learning is an $83 billion industry). Also, a second language enhances your resume; job searchers need every advantage they can get these days. "In this era of unemployment, language skills are very much in vogue," says Scott Sweet, senior managing partner at IPO Boutique, a research firm. "It can open up so many more doors." Though Rosetta Stone software is expensive  the typical three-level program costs about $500  it's still more cost-effective than the classroom, or extensive one-on-one tutoring. In a challenging consumer spending environment, however, that $500 could be used for more essential purchases. A second language is nice, but it doesn't pay the rent. Another challenge for Rosetta Stone: the barrier to entering the language learning market is small. "While we think its unique self-study program is scalable, niche software developers like this rarely enjoy success over the long-term," Lemos wrote in an April research note. "There are many larger software companies with much greater financial, research and development, and marketing resources, and Rosetta Stone's recent success could draw these firms into the market." It probably wouldn't cost a Microsoft or Google all that much to teach a foreign language. If these companies joined the translation trade, arrevederci to Rosetta Stone's dominance.